A couple of days I saw online that Barry M's had released three new polishes. I loved the look of all three so I went and brought them from Superdrug. 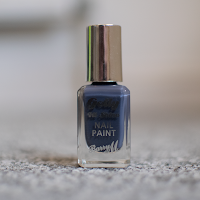 The polishes are Blue Jade and Matcha, both part of the Gelly Hi-Shine collection, as well as Purple Frost, part of the Molten Metal collection. 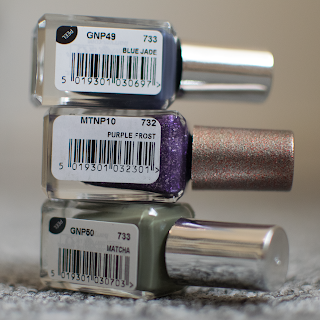 Each of these polishes costs £3.99 in Superdrug at the time of posting this. Let's start with Blue Jade. 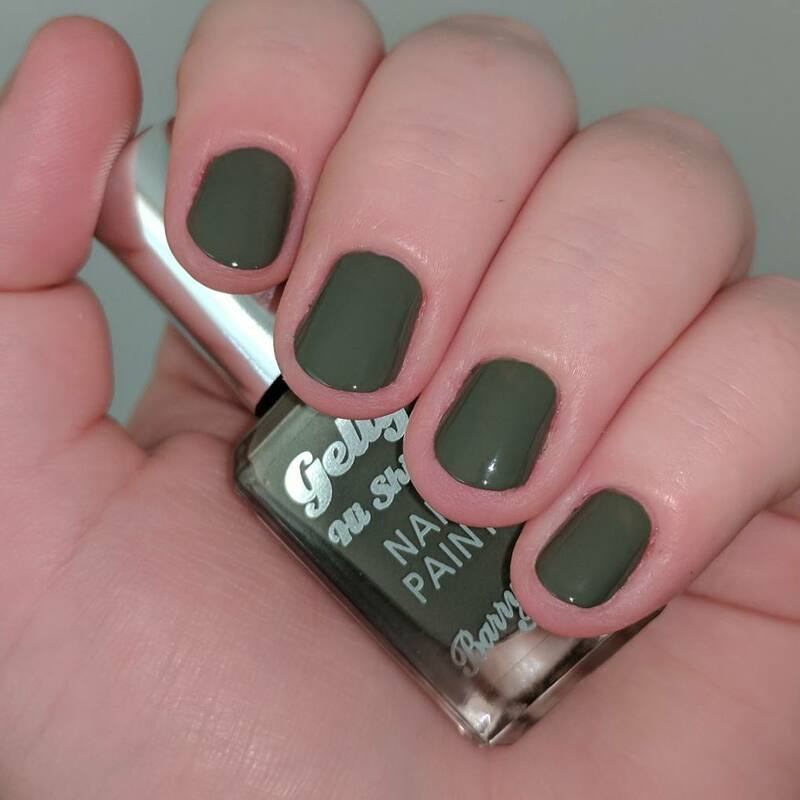 I LOVE LOVE LOVE this colour, I don't have any other polishes similar to this so when I saw it online I knew I had to have it. 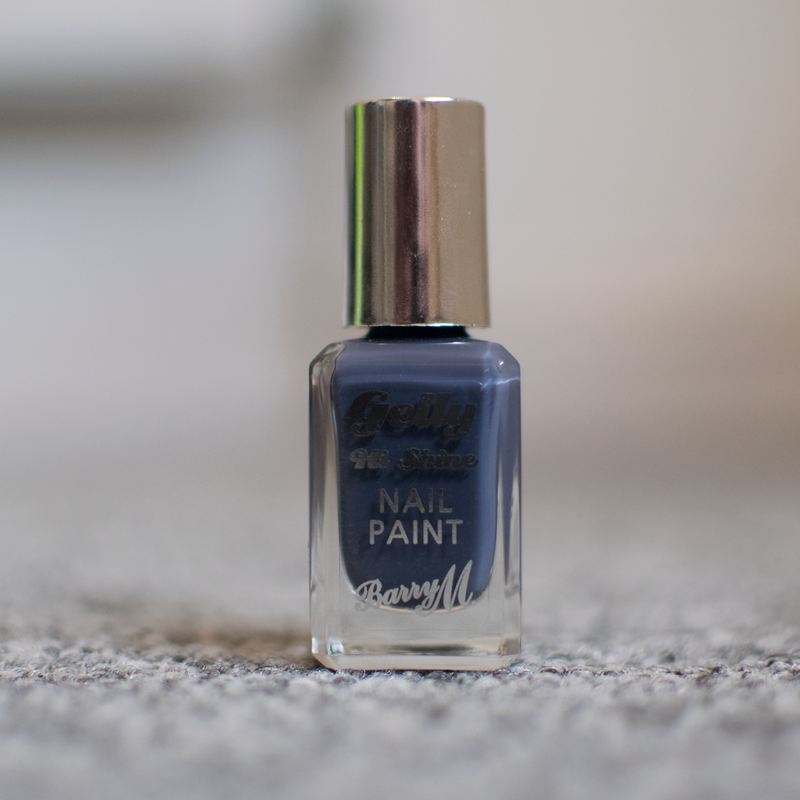 It is a dark grey-blue colour, which I found likes more grey in artifcial light (indoors) and more blue in natural light (outside). 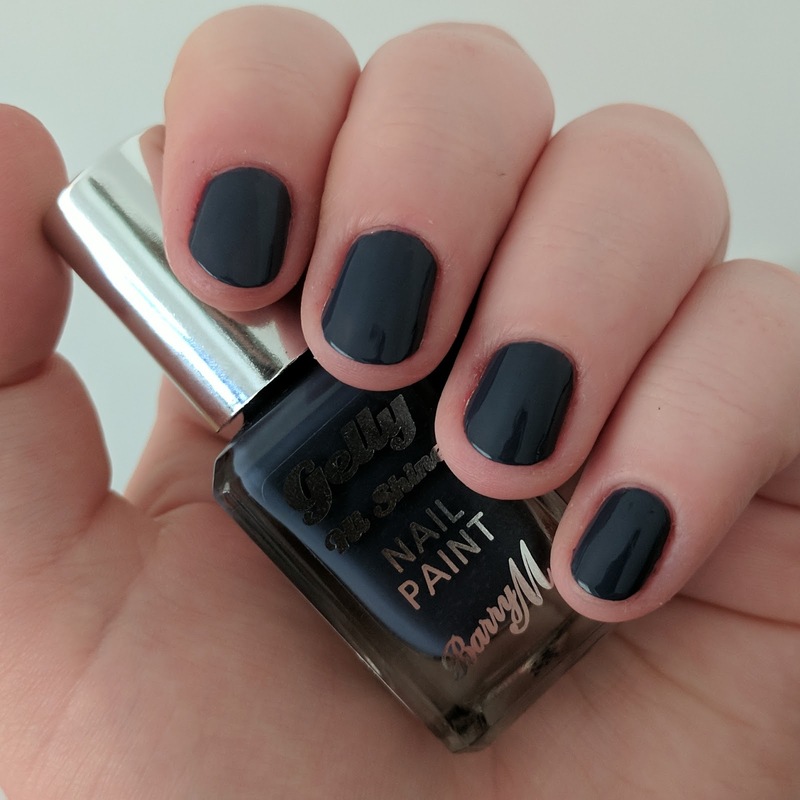 This is a perfect winter colour in my opinion. 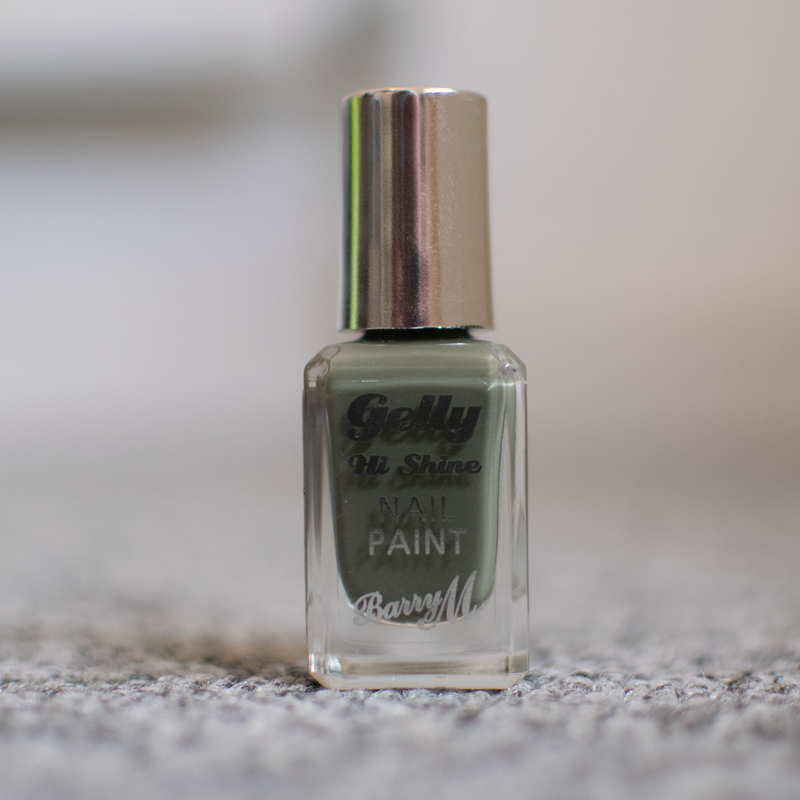 Just like the rest of the Gelly collection it is super shiny and dries reletively fast depending on the thickest of the coat. 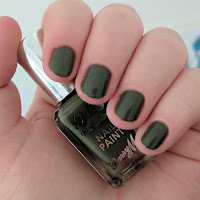 Pictures are two coats, no top coat. Next is Matcha. Now if this hadn't been released with Blue Jade then I might not have brought it, I don't usually go for darker olivey colours, but I thought it looked like it might go nicely when worn in combination with Blue Jade. And I was right! 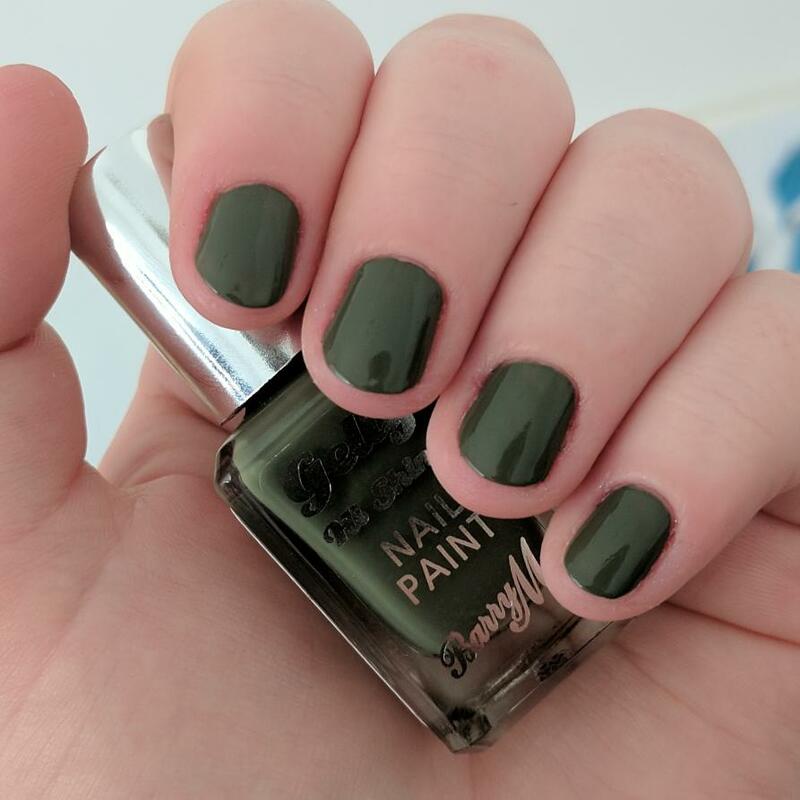 I'm actually really glad I got this polish, it's a much nicer colour than I expected. A lovely autumn colour. 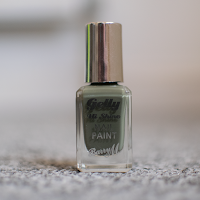 I don't feel this name quite matches the colour though, it's a dark, green khaki/olive colour rather than an acutal matcha colour, which is usually lighter and brighter. The pictures are two coats, no top coat. 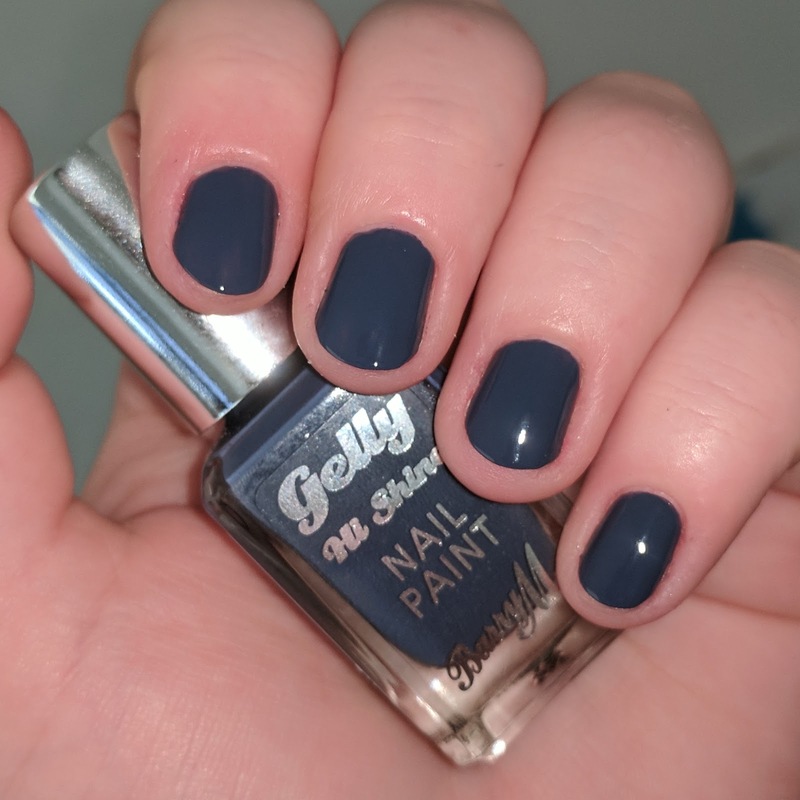 These two polishes look great together and are a perfect autumn/winter duo. 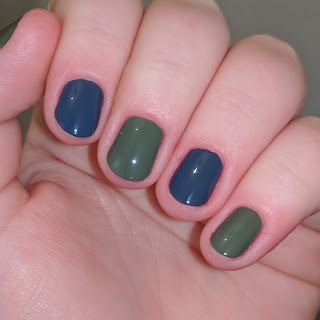 I will be wearing these two polishes together a lot this autumn/winter. The final of the three, is Purple Frost. 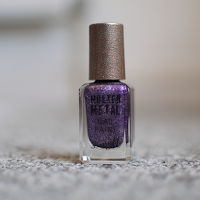 The last in the Molten Metal collection, which is one of my all time favourite Barry M collections. (I like shiny things hehe). 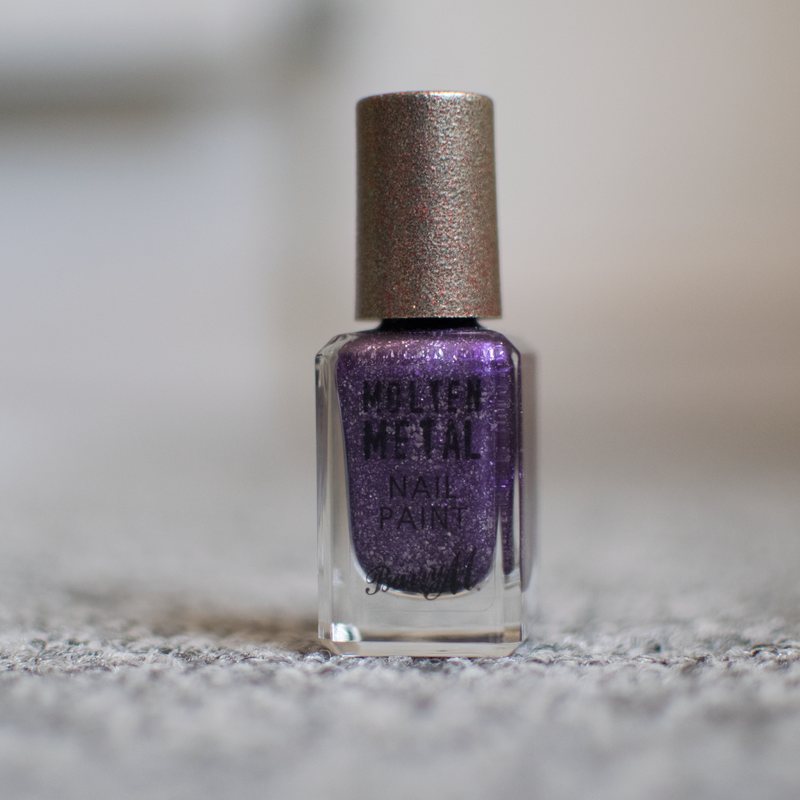 I own all of the other Molten Metal polishes, so of course I was going to buy this one. Was slightly random to just release one new colour to the collection, but very similar in release to the random Purple added to the Mermaid collection a few months after the originals launched. 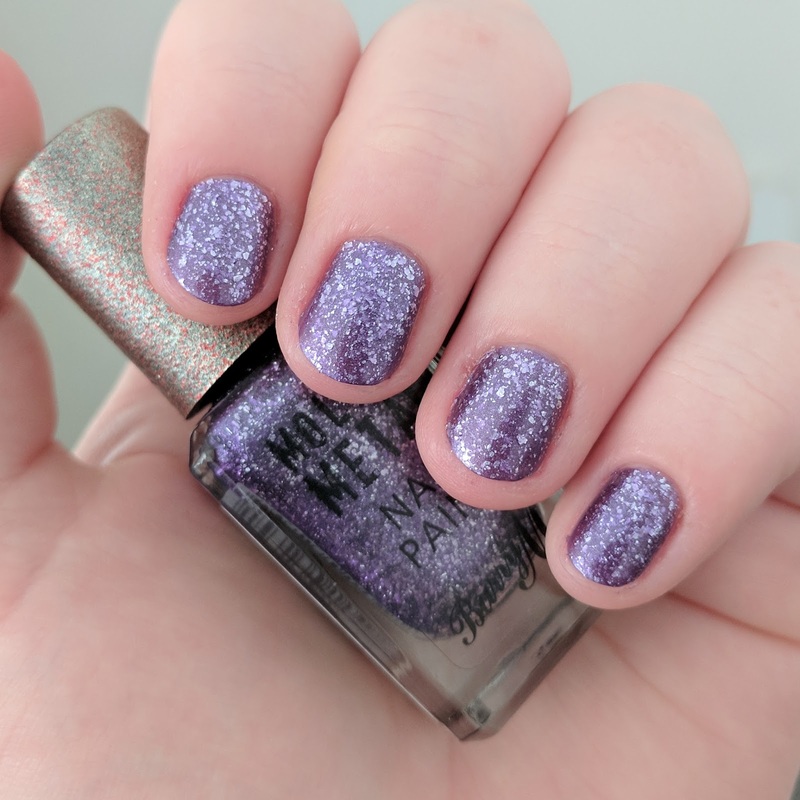 This is a beautiful, bright purple colour, and unlike the rest of the collection (which has packed tiny glitter particles), this has a mixture of size glitter, and larger silver flakes, which I love and wish there were more colours available like this (Barry M, please do a red like this, would be a perfect Christmas polish). 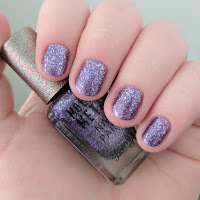 Needs two coats to be oqaue, as the first is quite translucent, the polish give excellent coverage and distribution of the glitter particles. 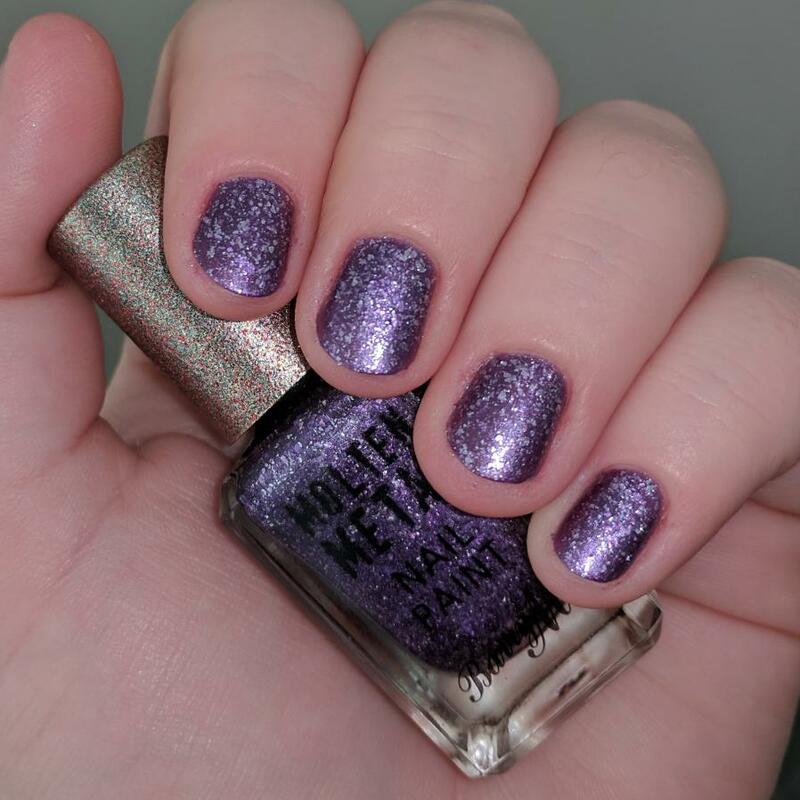 This polish would be a great one to wear for many of the upcoming holidays (espically Halloween and New Years). I think all of these polishes are worth buying. I'm glad a brought all three of them, no regrets. The Gelly ones are definitely more seasonal colours, but Purple Frost is a great colour for any season. 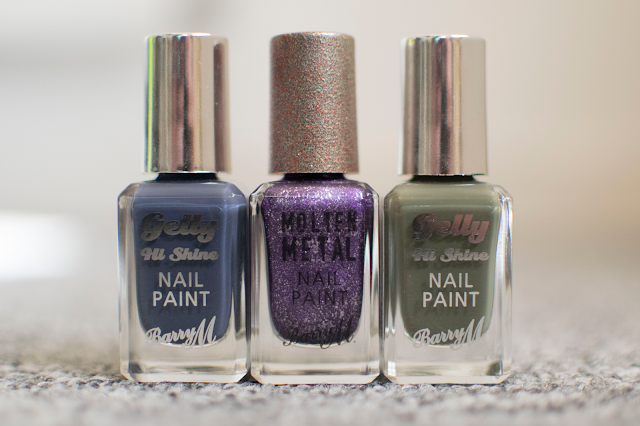 You can find these polishes for £3.99 at Superdrug or on Barry M's website. photos: all taken by me, swatches 1: flash 2: no flash.